The Practical Pantry began in 1998 as a recipe column for a weekly newspaper. From the beginning, the column has provided simple recipes that started with inexpensive ingredients most people have on hand or easily could find. The Practical Pantry Cookbook contains over 100 recipes that combine pantry staples with everyday ingredients, plus pointers for stocking a practical pantry, selecting and storing meat and produce, and making cooking easier. Whether you’re a faithful reader of the column or a cook looking to simplify mealtime, this collection of recipes, pointers, and columns from the first 10 years of The Practical Pantry will help you eat well while saving time and money. 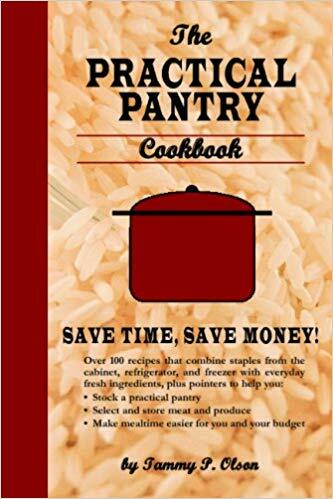 The Practical Pantry Cookbook includes such favorites as Quick Pasta Primavera, Easy Chicken Pot Pie, Slow-Cooker Beef Stew, Chicken and Wild Rice Soup, Garlic Mashed Potatoes, Savory Herb Rice, Simple Salsa, Crunchy Drop Cookies, and much more. Order The Practical Pantry Cookbook on Amazon.